Large phones are getting more popular now and Samsung seem to dominate this field with the Note series. 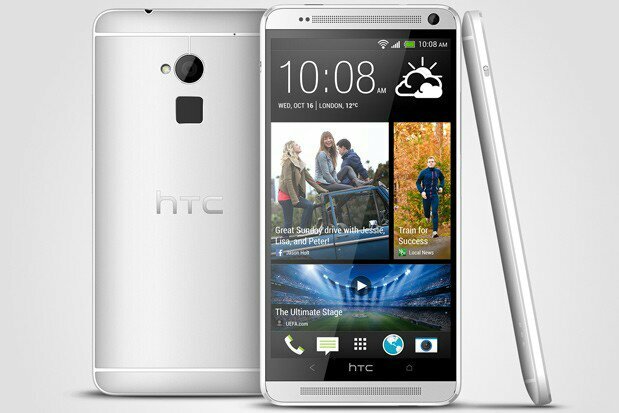 That is until now as HTC have just released the HTC One Max: an extra large version of the wonderful aluminium unibodied HTC One that has increased the 1080p LCD panel to a huge 5.9-inches. The One Max weighs in at 217 grams is 10.3mm thick and is16 centimetres long. The length obviously has to do.with the front facing camera and amazing BoomSound speakers. The battery has been increased to a huge 3,300mAh but if that isn’t enough you could bulk the One Max up even more with HTC’s 1,200mAh power case but it will set you back $90. So the size isn’t all that’s changed on.the One Max. The most noticeable being that fingerprint sensor on the rear of the device. The new scanner will allow you to log into your device with the swipe of a finger tip much like the one featured on the iPhone 5s. Another huge change and a very welcome one is the addition of a micro-SD slot for expandable storage allowing you to expand the 16 or 32GB of onboard storage by a further 64GB. Unfortunately the One Max has the Snapdragon 600 with 2GB of RAM which is great but I’m sure you feel the same when I say the new Snapdragon 800 would have been a better choice. The supported bands suggest great support for LTE networks in Europe and Asia, and as well as for Verizon and Sprint for those of you stateside. HTC says the One Max will start rolling out as early as this week so if you like what you see you don’t really have long to wait. The software has also been SIG if I can’t my upgraded taking it to version 5.5 of Sense which runs on top of Android 4.3. This new version gives the user a totally new level customization for the BlinkFeed news-glancing widget which in turn makes it even better. There are a few other changes that are detailed in the press release and spec sheet below as well as a load of pictures for your viewing pleasure. CAMERA APP: HTC Zoe™ with Sequence Shot, Always Smile and Object Removal. Gallery with Video Highlights and HTC Share. Continuous shooting and VideoPic. Slow motion video recording with variable speed playback.